No costs for grid extension or grid connection! 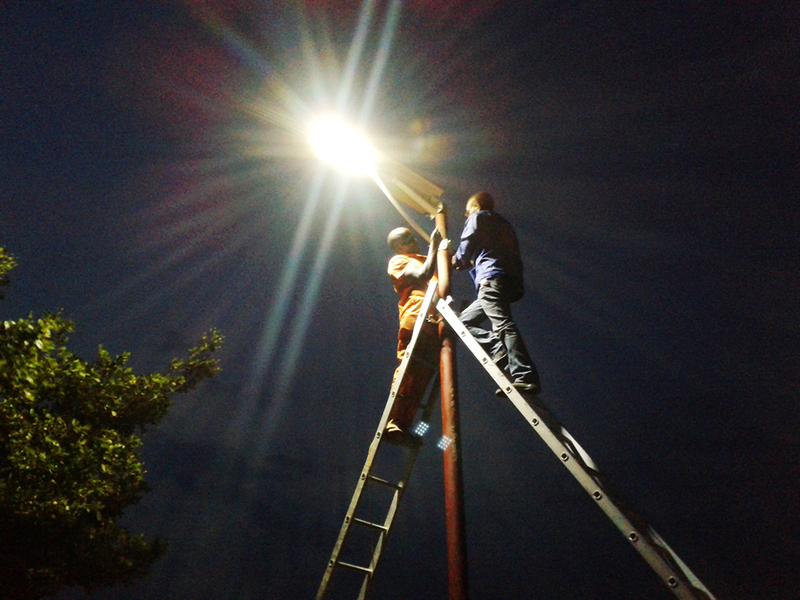 No more power costs for outdoor lighting! The Product Group is the latest generation of intelligent systems for autarkic lighting. -systems absorb the freely available daylight and release the stored energy through lighting in the dark. ISAL systems absorb the freely available solar energy through their solar module in the daytime. Solar energy is converted into direct current by a photovoltaic module and thus charges the battery during the day. At night or at dawn, the LED lamp switches on automatically by using the energy stored in the accumulator. In the morning or with enough daylight, the LED lamp switches off again. 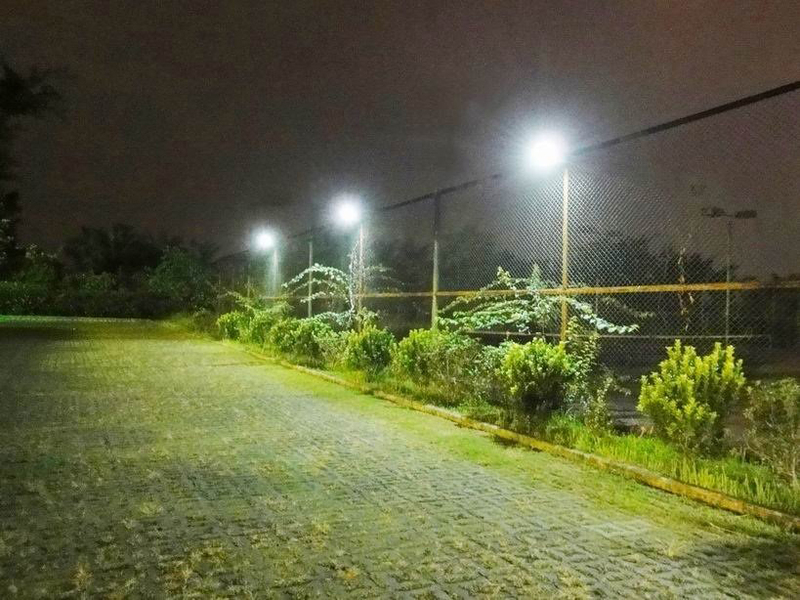 ISAL lights can be operated with continuous light at full brightness. 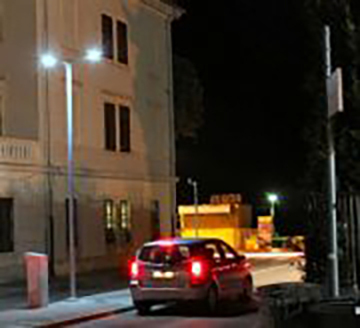 ISAL lights can be operated first with ⅓ and then with maximum luminosity due to the brightness sensor. ISAL lights are provided with a motion sensor, which turns on full illumination for 1 minute when motion is detected. ISAL lights switch to ⅓ luminosity at appropriate brightness and finally switch off. -systems are powered by solar energy and thus are grid-independent. Therefore, they provide a reliable alternative to conventional illumination by delivering light from twilight till dawn. LED stands for light-emitting diode, or light diode for short. LED is a light-emitting semiconductor component with electric properties corresponding to those of a diode. When electric current flows through the diode in the forward direction, it emits light with a wave length depending on the semiconductor material and the doping. Manufacture-related deviations may occur in the colour temperature and brightness values in the production of light-emitting diodes. Therefore, the data sheets of each offered class („bin“) show various illumination intensity. LED has already taken about 50% of the lighting market. 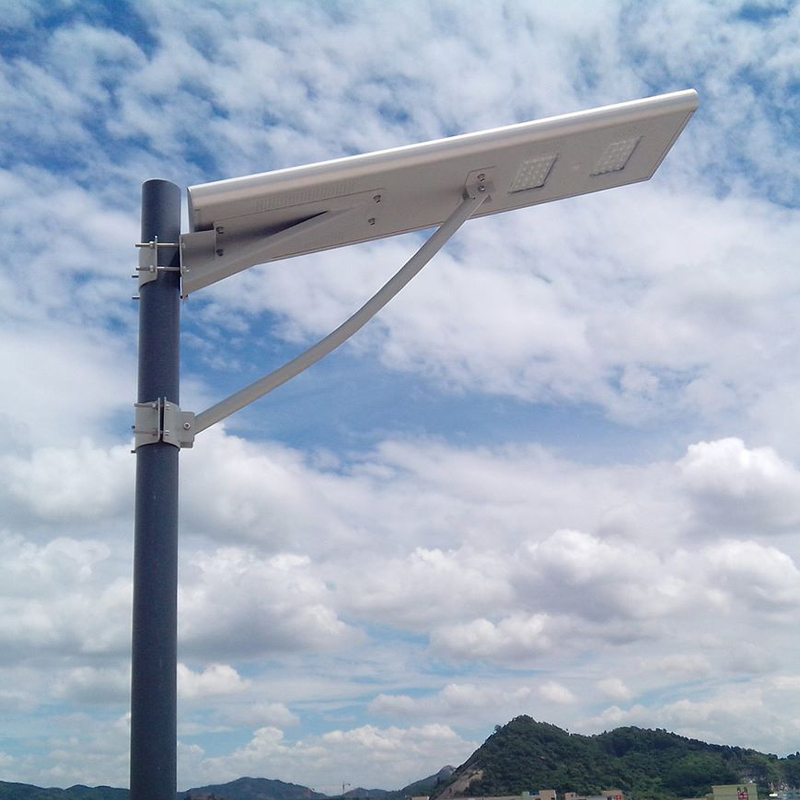 This is mainly due to its high energy efficiency, its natural and cool light, its lifespan, its gradual and not just sudden outage as well as its robustness. LEDs installed in ISAL systems illuminate a relatively large area due to their lighting viewing angle of 120°. At the same time, they are characterized by a high light output of 120-130 lm / W (lumens per watt). Thus they are many times more efficient than conventional incandescent lamps (about 10-14 lm/W) or halogen lamps (15 – 20 lm/W), and even much more efficient than fluorescent lights (70 – 90 lm/W). Unlike with incandescent lamps, LEDs show increased efficiency when operated at lower than the nominal power, for instance with intelligent intermittent switching. At the same time, the lifespan is longer due to the reduced temperature. The life expectancy of LEDs is over 50,000 hours, which is about 5 times higher than that of comparable fluorescent or halogen lamps. The switching frequency, in contrast to halogen and fluorescent lamps, has no negative impact on the life expectancy of LEDs either. Thus the combination of a LED lamp with a motion detector is not associated with lower life expectancy of LED lighting. Considering all material and energy flows, from manufacturing to the end of useful life, light generation accounts for over 98% of total energy consumption. LED lamps are therefore very efficient both in their use and production. 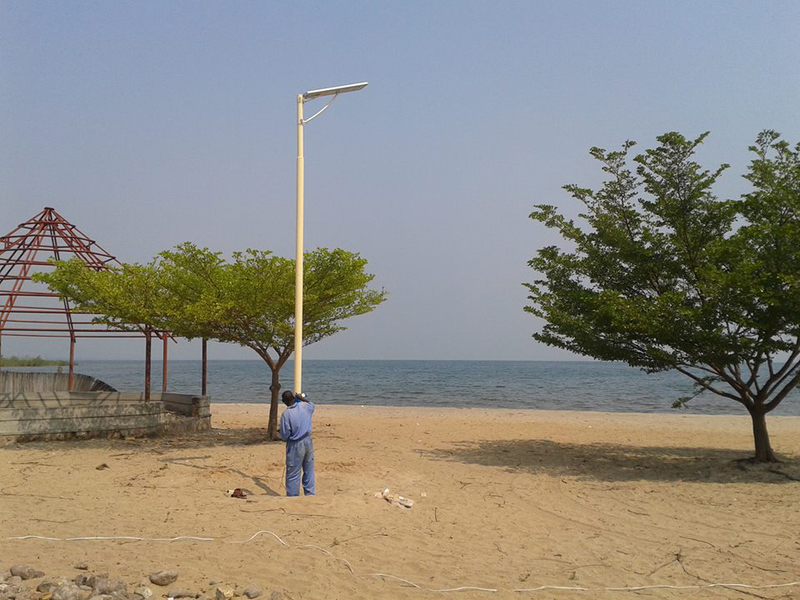 By way of example, according to the Stiftung Warentest (2013), the life cycle assessment of LED lamps is better than that of compact fluorescent lamps or even halogen bulbs. Unlike fluorescent lamps, LEDs are free of mercury and thus pose no health risk to people even in case of damage. However, the electronic components and rare earths contained in LEDs must be disposed of as electronic scrap. A photovoltaic system is a solar power system, in which a portion of solar radiation is converted into electric energy by means of solar cells. Such typical direct type of energy conversion is called photovoltaic. The solar module consists of series-connected solar cells, which are hermetically sealed. Monocrystalline solar cells are manufactured separately and are subsequently connected by metal foils, while silicon serves as a semiconductor. 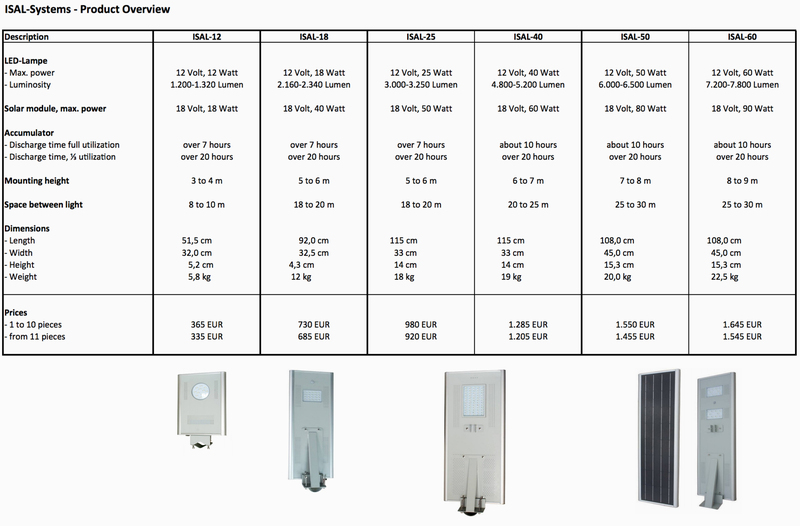 At option, the off-grid solar power modules of ISAL systems are separated permanently or temporarily from the power grid. Power supply is not required. During the day, the unused power is stored provisionally to be further used according to the needs. ISAL systems are operated with 12 volts DC. The applied accumulators for solar energy storage, the so-called solar batteries, show high cycle stability (charge and discharge), i.e. long lifetime. High-quality Li-Ion batteries maintain the lead against the cheaper lead-acid batteries, as their operating costs are significantly lower due to their longevity. Thus we assume that the battery needs to be replaced every 5 years at most. Accumulators installed in ISAL systems to store solar energy are protected against deep discharge or overcharge through a charge controller. 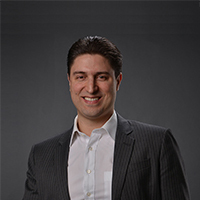 Der Finanzfachwirt (FH) Marco Rubiales ist seit rund 20 Jahren geschäftsführend in der Vermögensverwaltung und dem Finanzwesen tätig. In den Bereichen der Unternehmens- und Wirtschaftsberatung liegen seine Kernkompetenzen in der Entwicklung von Vertriebskonzepten sowie dem Liquiditäts- und Entgeltmanagement. Bei SC Garant ist Marco Rubiales vor allem für die Geschäftsbereiche „Produktauswahl“ und „Organisation“ zuständig. 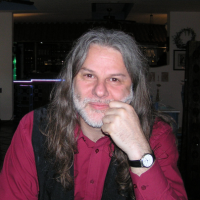 Dr. Daniel M. Porcedda ist gelernter Rechtswissenschaftler, Hochbautechniker sowie PR- und Werbefachmann (IHK). Zu seinen weiteren Fortbildungen gehören u.a. „Passive Solararchitektur“ und „Werbepsychologie“. Er ist Osteuropa-Experte und Spezialist für internationalen Handel. Seit einigen Jahren ist er schwerpunktmäßig in den Bereichen „EU-Fördermittel“ und „Firmensanierungen“ tätig. Bei SC Garant kümmert sich Dr. Daniel M. Porcedda vor allem um die Themen „Produktentwicklung“, „Innovationen“ und „Marketing“. SC Garant GmbH & Co. KG undertakes the general agency in Germany and other countries regarding products with unique selling points. The letters „SC“ stand for Selective Cooperation, as cooperation is entered into only with selected manufacturers whose products have high customer benefit and are right on the cutting edge. At the same time, „Garant“ stands for the reliability and longevity of the products offered as well as for the reliability of our company and our competent local staff towards our customers.